Can we say "too clever by half?" Ralph Northam must really think we’re all idiots. Or he’s so committed to serving Dominion Energy’s best interests, as opposed to the best interests of the citizens of Virginia, that he doesn’t care one way or the other whether we are smart, idiots, whatever. There’s simply no other explanation for why he thinks he can pull this kind of slimy, too-clever-by-half move and expect us to buy it. Seriously, Northam’s latest move is to assert – on what legal grounds, I’m not sure exactly – that newly appointed members to the Virginia Air Pollution Control Board won’t be seated, and thus won’t vote, until AFTER a crucial meeting to determine the fate of Dominion Energy’s proposed compressor station, for its fracked-gas Atlantic Coast Pipeline, in the historically African-American Union Hill community. This, after Northam’s spokesperson claimed, laughably (again, they must think we are all idiots), that the timing of the Air Board dismissals was “not because of anything pending before the air board.” Hahahaha. And if you believe that one, I’ve got a nice fracked-gas pipeline and compressor station to sell you…for just a few billion dollars, guaranteed by Virginia ratepayers. Such a deal! Oh, and also completely laughable: Northam’s spokesperson’s claim that replacing board members was just business as usual. In fact, as the RTD reported on November 20, there are 235 expired positions on state boards that have not been filled. So why were these two Air Board members’ expired terms so unique that they had to be suddenly, summarily dismissed? November 16: Northam named two new members of the Air Pollution Control Board – Gail Bush and Kajal Kapur – neither of whom have expressed clear views on the Atlantic Coast Pipeline or the proposed compressor station in Union Hill, and neither of whom have been a part of the lengthy, complicated, technical discussions on this subject. Hmmmm. 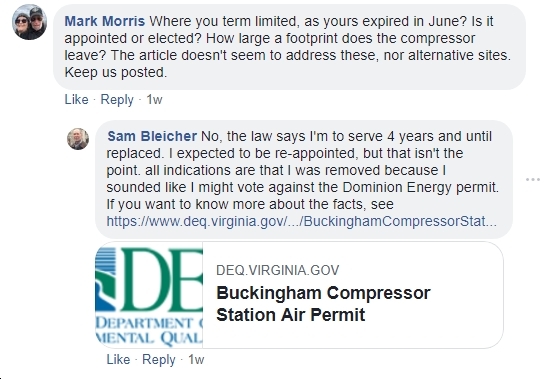 November 17: One of the dismissed members, Sam Bleicher, wrote publicly on his Facebook page (somehow missed by other reporters): “Was Dominion Energy involved in the decision? 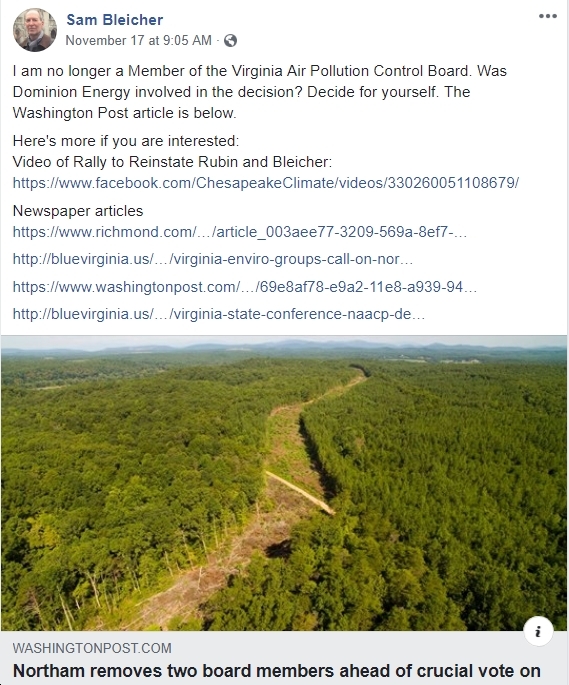 Decide for yourself.” Bleicher also added, in a comment on that same page, “all indications are that I was removed because I sounded like I might vote against the Dominion Energy permit.” Fascinating, eh? November 21: Environmental group Wild Virginia filed two Freedom of Information Act (FOIA) requests: 1) related to Northam’s 11/19 meeting with Farrell; and 2) related to Northam’s HIGHLY suspicious dismissal of two members of the Virginia Air Pollution Control Board and equally suspicious appointment of two new members most Virginia environmentalists had never heard of before. November 21: Community Idea Stations reported that “One of Governor Ralph Northam’s new appointments for the State Air Pollution Control Board says she was first contacted ‘a few days ago’ about the role” and that it was a “delightful surprise.” Uhhh…yeah, just delightful – for Dominion Energy, perhaps! 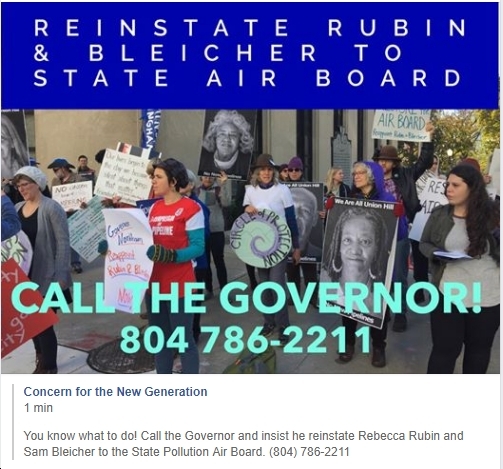 As Mike Tidwell of the Chesapeake Climate Action Network put it, “Clearly, this was a sudden, rushed decision by the Governor…The timing is stunningly suspect.” Big time. And, by the way, now that the new appointees will not be seated until after the crucial vote on 12/10, any pretense that this was a simple swap-out of members is nonsense. Clearly two no votes were removed to rig the vote. November 21: Northam was asked by a member of the Virginia Student Environmental Coalition (VSEC), “I was wondering if you expect new air board members to vote without having heard any public comment?” Northam’s non-response: “I hope you have a wonderful Thanksgiving; thanks for being here.” Pathetic. November 26: The RTD reported that the two new members of the Air Pollution Control Board would NOT vote on the compressor station December 10, and that the dismissed members weren’t being reinstated. By my count, including one member who has recused himself for some reason or other, there will only be four members (out of seven) voting on December 10, with at least two – and possibly more – likely “no” votes either off the Board or recused. Brilliant, eh? Bottom line: None of this looks normal. None of this sounds normal. None of this smells normal. Because none of this IS normal. Unless, perhaps, we’re talking about another administration…you know, the guy who Ralph Northam used to refer to as a “narcissistic maniac.” The solution? Immediately reinstate the dismissed members of the Air Board and stop acting like that orange-tinted dude across the Potomac River.